Our next Beer Is Culture finalist, Tom O’Shea, took us to a familiar place with his entry: home. His needlepoint-inspired piece bridges the gap between rustic and modern mediums, and just makes us feel cozy inside. Tom is a graphic designer for a weekly newspaper in Camden, NJ, and a native of Philadelphia. He now resides in Wilmington, Delaware. Here’s more from Tom below. TOS: I started out trying to make something that looked like a tapestry that would show beer throughout history, since tapestries were often used to record major events or cultural figures. I began experimenting with a few of the preexisting patterns and filters in PhotoShop after I had created the large glass of beer that would be the centerpiece. None of them were quite working out, so I decided to create a custom pattern. But as I looked at the results of one of the failed experiments, I thought it looked a lot like a (needlework/cross-stitch) sampler. I showed it to my wife, who is also a graphic designer, and she agreed, so I started heading in that direction. 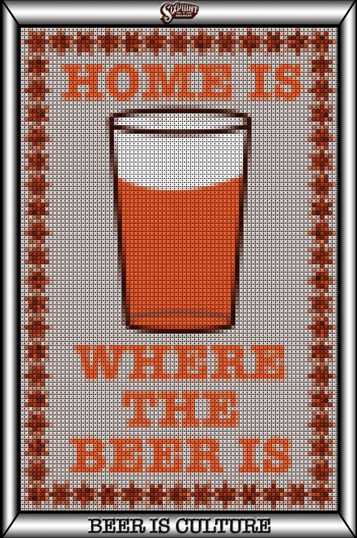 I thought an iconic example of cross-stitch artwork such as “Home Is Where The Heart Is” could translate well to the world of beer, because anywhere you can find great craft beer is place you could call home. I thought this was also a great example of culture on the smaller scale, since samplers can be a custom form of art made by a particular group of people. TOH: I actually have a bachelor’s degree in journalism from Temple University, but I studied all aspects of journalism and the classes I excelled in and enjoyed the most were editorial design and photography. I started out my career as a reporter, but quickly began doing more on the design side of things and eventually ditched the writing (professionally) completely. I also took some design and PhotoShop workshops, but most of what I learned, I learned on the job. I also think genetics came into play a little since my mother is an artist and my father is a retired printer, so I sometimes feel I was born to design for print media. TOH: Art created on a computer is sometimes viewed as more disposable than other forms of art, but it still takes the use of specialized instruments and the development of skills to create it. A big part of my job deals with using PhotoShop tools to manipulate photos to create the optimal contrast or color balance for printing on newsprint. I use those same tools in different ways to create art. Whether you’re using an exacto knife and typesetting in paste up, or a computer design program, you can still create a good visual piece. But one of the big advantages to computer-generated art is the “undo” command which makes fixing a mistake much easier than it is in other art forms. I wouldn’t say art created on a computer is better or worse than more traditional art, but I think it is faster and with the use of the Internet it can be shared more easily – isn’t that a big part of what art is supposed to be? Sure, creating a work of art for oneself might be fulfilling or therapeutic, but until it is shared with others for them to experience or be inspired by, it hasn’t reached it’s full potential. TOH: Jon Langford is a big influence. I first became a fan after seeing some of his original artwork which has been turned into prints for use as album covers and some beer labels of a certain Delaware brewery (which I won’t name on your website). The labels were nice but the original art was created on pieces of wood with imagery from old country music publicity photos and sheet music. There was just so much texture and depth there. I try to create a sense of depth and texture in my design work, especially in the labels that I create for my own home-brewed beers. I also admire Wes Freed, who has designed most of the Drive-By Truckers album covers. TOH: When I hear the phrase I think of how beer is a window into different cultures around the world. A great example of this is the very malty beers of Scotland and the story behind their unique taste and ingredients. Hops were not native to Scotland and Scottish brewers had to pay high prices for hops to be imported from England, which was something many Scots couldn’t afford. Prior to hop availability, Scottish beers were balanced using other plants and herbs native to Scotland. While these other ingredients could add bitterness to beer, they couldn’t preserve the beer as well as hops did. Hop flavors were also viewed as being “English” and Scotland was trying fiercely to hold onto their own culture and not get invaded by England’s spreading influence. So the Scots used hops sparingly as a preservative only, giving us the malty beers that are still brewed there today. This is only one example of how a country’s culture directly affected the style of beer we associate with that country. Here in the US we can watch how beer mirrored the changing culture of the country over time. In the early days of America individuals built, grew or made what they needed; and one those things was beer. Some of the founding fathers were, in effect, home brewers, making ale that was hand crafted and unique for everyday consumption. When immigration began to explode many people from countries other than England arrived and they brought their beer culture with them. The best example of this is the German lagers that soon dominated the beer landscape of America because of the expanded railways and improvements in refrigeration. Later in our history, after prohibition, America moved toward more industrialization and assembly lines churning out flavorless white bread and easy-drinking, flavorless beer. Speed and convenience were valued over craftsmanship. Now, America is moving back toward appreciating quality over quantity in what we are willing to purchase. No example of this is better than craft breweries like Sixpoint, because we all know that when something is crafted it truly is art.